For most pool services businesses, the spring and fall book end the “busy season”. Yet scheduling, routing and billing is cumbersome because of outdated processes and limited time within the season. Work becomes backlogged and invoices are left outstanding. According to a study conducted by IBIS World, an industry researcher, families that have an annual income of over $100,000 are the largest segment of pool owners in the United States, and since that group is growing year-over-year, the number of pools being installed and serviced could grow as well. Because of this, businesses will need to manage their growing customer base in a more sophisticated manner than using pen and paper or whiteboards. Pool services software helps businesses manage their customers’ data from both the office and the field. There are many software solutions on the market for pool service professionals to use, so it can be difficult evaluating all options. Each has similar functionalities, such as scheduling and customer data, however, each has unique traits that may make one a better fit for a company than another. “While plenty of software providers offer solutions for pool service businesses,” explained Taylor Tuomie, a Marketing Specialist at HindSite Software, “most got their start in another industry, such as HVAC or construction. Because of that, there are features that aren’t available that might be needed for pool specific work, such as chemical and part tracking”. Tuomie said that HindSite created this guide for pool service businesses that plan to implement a software solution for their business. 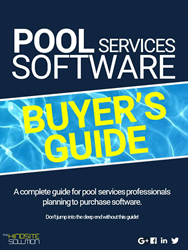 The Pool Services Software Buyer’s Guide contains background of the pool services industry, information on what software does for those businesses, questions you should ask each vendor when evaluating a solution and also a side-by-side chart that pool services professionals can use to compare features. “We wanted to create a guide to educate pool services professionals on features and functionalities that might be important to their business,” said Tuomie. “While other field service industries have educational resources, the buyer’s guide is the first of its kind in the pool services industry. Purchasing software costs a business both money and time. HindSite’s free guide explains the different pricing models that are used as well as what buyers can expect for implementation time frames”. HindSite Software has helped pool services contractors better manage and grow their businesses with field service management software since 2001. HindSite today assists service businesses with scheduling and billing (e.g quickbooks scheduling software), contact management, field data collection, and invoicing with accounting software, such as QuickBooks®. This paperless field service management software has been proven to increase efficiency and organization, meaning greater profit potential with less administrative time.